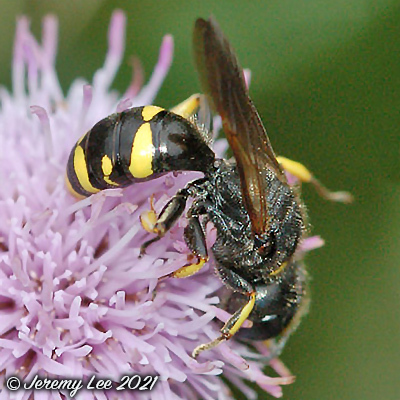 Ectemnius continuus, a digger wasp, is one of several burrowing, usually solitary wasps of the family Sphecidae that excavate nests in soil which they provision with prey paralyzed by stinging for their larvae to feed on. Found in various habitats but perhaps most frequent where abundant supplies of dead wood and umbellifer flowers are available. Can often be seen on such flowers in summer, feeding on pollen. Can be found early May to late September, peaking in June, July and August. Widely distributed in Britain as far north as Fifeshire; it is one of the most common Ectemnius species, especially in the south. Ectemnius species are difficult to separate so care needs to be taken with identification. It has the familiar black and yellow colouring associated with this group.